Last edited by dmzx on Fri Jul 06, 2018 8:52 am, edited 5 times in total. 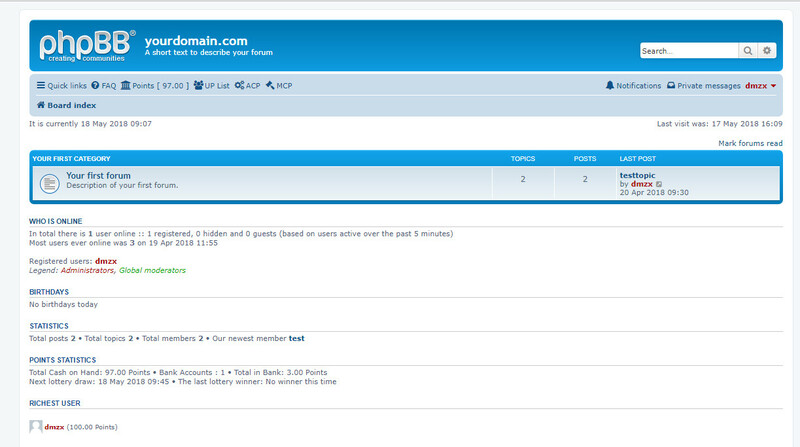 I use phpbb 3.2.0 with UP version 1.2.0 and i set transfer permission for users in one user group to "no". But the users have still the button in profil [Donate]. 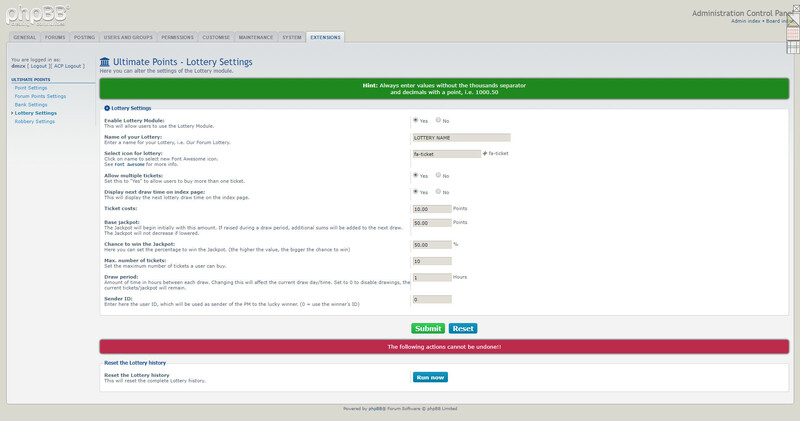 After click on [Doante] and fill all boxes it will show an error > "You don´t have enough points".I set the permission to "NO" and it will still be displayed . 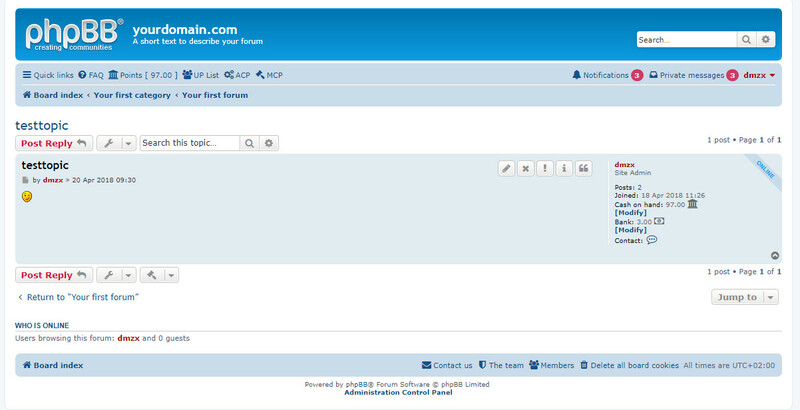 In the control panel of Ultimate Points (in UCP) the menu "transfer" is not displayed. Very thanks for this update 1.2.1 !!!!! I hope in next update the github issues #5 , #4 and #3 can be include. Great job , keep on going! Amazing work dmzx. I can see great, great potential in a full points system. 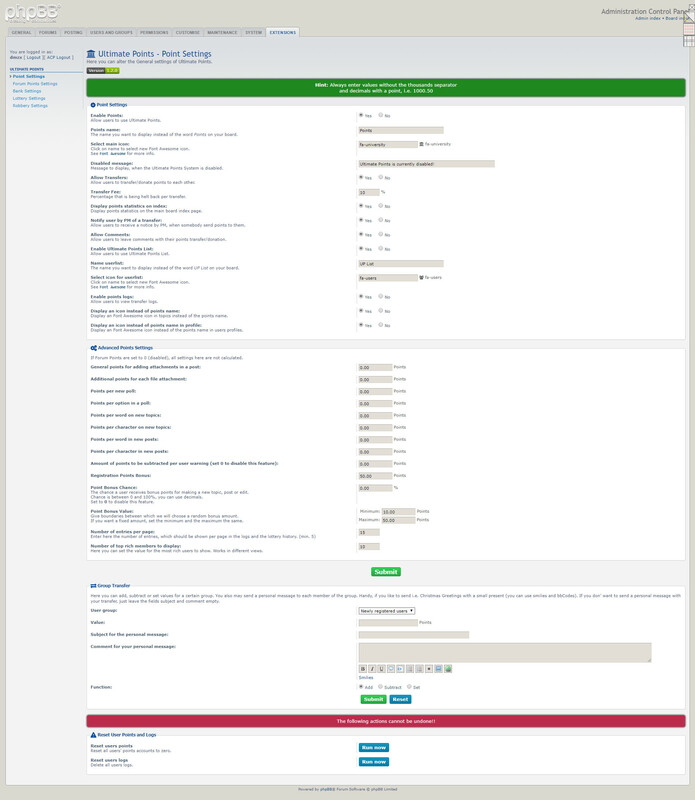 Edit: do you have events added so people can make companion extensions? No not yet in, will look into this. 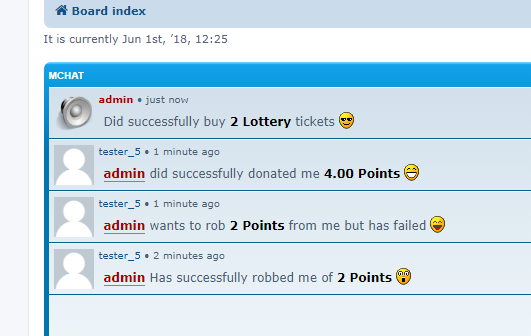 I'm getting a few users complaining that the lottery isn't paying out occasionally. Multiple people are entering, but nobody is winning. The jackpot is reset as if a prize was given out. Is this related to the "Chance to win the Jackpot" setting by any chance? Yes, I tested this with 50%, and there was a winner after 4 drawings .. better to set it higher. 80 or 90% or even 100 is you want a winner every drawing. Could users spend their points on something other than lotteries? What about spending points to add your own custom rank that is displayed under the avatar? 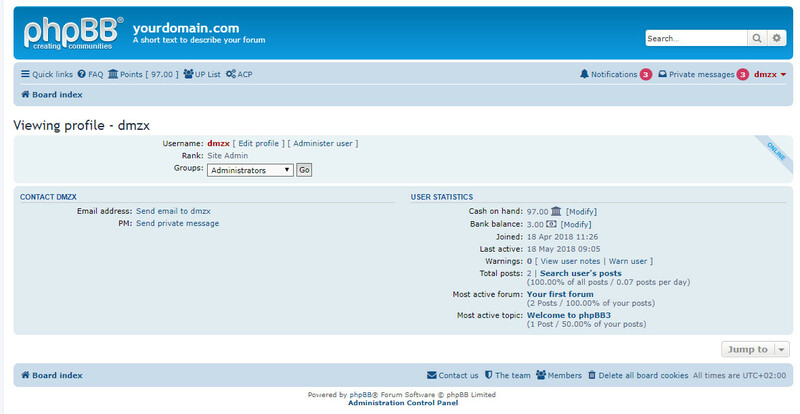 Also, my forum uses Postlove (viewtopic.php?f=456&t=2246576). Would it be possible to gain points every time a user get a like on a post? It all worked.thank you!So cool!!!!! I was able to get this working with the referral ext just fine, however, can anybody tell me if there's a way to award daily login points using Ultimate Points? I looked all over online and can't seem to find anything. Any help would be much appreciated. 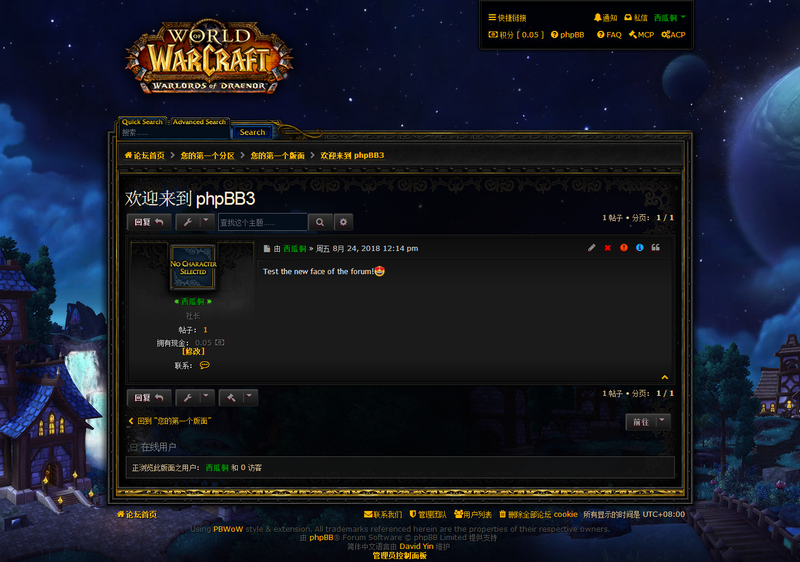 Hi, thanks for bringing this over to 3.2, I used the 3.0 modification a lot. I don't remember if the 3.0 modification had this feature, but is it possible to do a mass recalculation of user points? This would be so I can install it onto a board and award every member the correct amount of points according to their forum history, as if the extension was active since day 1. Also I've noticed when the Bank is disabled it still shows Bank information on a member's profile, I'm not sure if that's how it's supposed to function?